I have been working on the syllabus for one of my classes, and I wanted to start the year very purposefully. This is, in part, taken from Making Thinking Visible (my summer read, review forthcoming). This class will be a place where thinking is valued, visible, and actively promoted as part of the daily experience of ALL students. This class will explore properties and interactions of atomic and molecular structures of matter. This class will explore the impact of chemistry on our local and global communities. In the days that followed I reflected upon what happened and I decided that my students primarily had procedural skill and fluency but very limited conceptual understanding or the ability to apply mathematics. I realized that for my students to “understand mathematics” they would have to have a more balanced understanding that included all three. This experience provided the foundation for why I value using real-world applications whenever possible. They provide a context for building the conceptual understanding and procedural skill needed for rigorous mathematical understandings. Problem-based learning anyone? I know Shawn Cornally knows what I’m sayin’. I think a further issue is the order in which these three pillars are addressed. What might seem like a logical progression (skill -> concept -> application) might cause students to focus so much on the first or second part that they miss the last piece. What would it look like to reverse this in the classroom (application -> concept -> skill)? Not sure yet. Sounds like a topic for another day. I have been reading a book (review forthcoming) and it has me thinking a lot about what “scientific literacy” means, and how we as science teachers can teach guide our students to become more scientifically literate. In particular, I have been thinking about the context of my conceptual chemistry class, which is designed for students who need to complete their required full-year science course after 10th grade biology. Many of these students are not looking to go to college, and chances are this will be the last science class they ever take. I have dedicated a lot of thinking time to how I can better prepare them to be citizen scientists; using their scientific literacy productively in their lives outside of the classroom (and hopefully continuing to use it into the future). 1. What does science literacy look like? Being familiar with scientific experiments; their design, drawing conclusions, interpreting data, etc. 2. What do citizen scientists do? What do you think? What else should be added to these lists? Any thoughts in the comments are greatly appreciated. When I saw the title of this, I was skeptical. I thought I was going to see a video that described how we should be showing students all of the fascinating things that science offers. For chemistry in particular I hear too often from some teachers how we should do more “cool” demos and “blow stuff up” and get kids excited about science. However, their “excitement” seems to translate into an expectation of being entertained, and if things aren’t blowing up then science is boring. I’m not trying to say that a teenager’s desire to blow things up can’t be channeled into more explorative inquiries, but I don’t see doing more flash-bang demos as the way to encourage that. Fortunately, that’s not what this video is about. I think a more appropriate title would be “Making Science Accessible“, or even “Making Science Engaging”, as it focuses on how textbooks are so focused on getting the science just right and using all of the appropriate scientific jargon even if it is completely unnecessary in the context of the desired learning. I think biology in particular is prone to over-vocabularizing (made that up), but chemistry is not far behind. There are many examples of words that are used to describe chemistry concepts, but are not always well-defined in an understandable fashion – atoms, molecules, solutions, chemical equations, subatomic particles, mass, units of measurement (especially moles! )… I could go on. He does also make the point, which should be reiterated, that this is not a “dumbing down” of science content but rather communicating the science concepts in plain language (read: not unnecessarily technical); something that we as content “experts” often take for granted. A student who can use the word “atom” correctly in a sentence does not necessarily understand what an atom actually is. I remembered what I consider one of the most egregious examples of this unnecessary verbiage as we were starting mole conversions today – “formula units”. Ugh. Is the distinction between formula units and molecules really necessary? What benefit is there to the students, other than the fact that they can mindlessly attach a unit along with Avogadro’s number that happens to match the units specified in the word problem? In the context of learning to do mole conversions, is it helpful or hurtful to make this distinction? As I mentioned in my last post, I have been working through Wiggins and McTighe’s Understanding by Design in order to gain a better understanding of using a backwards design process. Part of the process has been brainstorming “big ideas” that I think are at the core of chemistry1, and I came up with 5 of them. The list below has them from the “biggest” ideas down to the “less big” ideas. I think it stands to reason that general science skillz (designing and performing experiments, collecting and interpreting data, drawing and presenting scientific conclusions, etc.) which are fundamental and continuous through all science disciplines is the biggest of the ideas covered in a chemistry course. One thing that I’ve though for a long time (and that fits perfectly with the Modeling Chemistry curriculum!) is that students need to have a basic understanding of the evidence and reasoning for how we know that matter is made of discrete particles and not continuous before you can move on to deeper chemistry topics. Too often traditional chemistry courses (not to mention earlier science courses) jump right in to talking about atoms as fundamental building blocks, but take for granted the justification for how we know atoms exist. The icing on the cake here is the fact that this piece of chemistry/physical science is fraught with common misconceptions2 (see section 4d). Quick note: these next three ideas have approximately the same “biggishness” in the scope of a chemistry course, representing some of the fundamentals of chemistry-specific content. I’ve struggled a bit with this one. I think there is a tendency to focus more on chemical reactions (types of rxns, stoichiometry, balancing, etc. ), but conservation of mass encompasses all of that PLUS it also includes physical changes, which is crucial for a thorough understanding of chemistry. However, you could also make the argument that physical changes are already included in the particle nature of matter… although not necessarily from a conservation standpoint. Chemistry is all about atoms – periodic trends and atomic structure are two big components but it could also include nuclear chemistry as well (if you’re into that). Material properties are all about the different types of bonding. The obvious topics here are ionic and covalent (and metallic) bonds, but there’s also polarity/miscibility, intermolecular forces, and solubility. What am I missing? Any thoughts or feedback would be much appreciated! These big ideas also (conveniently) happen to align with our state/district standards, which I am also trying to more efficiently and effectively disseminate into specific learning objectives and assessment tasks – a post for later! For my masters program, I am doing action research this fall into how effective certain teaching methods are in addressing students’ misconceptions. More to come on that later! Last spring, our district chem teachers finally got our act together and created our standards, based around our state standards being put into more student-/parent-friendly language. This summer, we’ve been working on creating a rubric for each standard that could be used on any general assessment fitting that standard. I’m getting pretty good at rubrics. At my school we are encouraged to use backwards design, which is used throughout our IB program (even though I don’t teach any IB classes). Other than an hour or so introduction to BD when I started 2 years ago, we haven’t gotten much guidance to really use it effectively and on an ongoing basis. Also, we are the only IB high school in our district, so getting other teachers on board with using IB stuff is often difficult. I’m still working my way through it, but I have been enjoying reading about the philosophical aspects of understanding and how that plays out in designing curriculum. Since we’re getting new textbooks this year for our lower chemistry classes across the district, I figured now was as good of a time as any to start figuring it out and trying to get some collaboration with it. I only taught one section of general (traditional) chemistry last year, and I was not very happy with it. I wasn’t involved much in the planning of it because I was more focused on the lower chem classes that I alone was teaching. I’ve been trying to figure out ways to make it better for me and for the students. I would love to attend a modeling chem workshop; maybe next summer? I feel like my Google Reader feed is never empty, and I always have at least one browser window open with a bunch of things I want to read. Oy vey! I’ve got a pile of them, physically and digitally. I also have a couple more book review drafts that I would like to finish, so hopefully I’ll find some time to finish those and get them posted here (finally). 6. Trying to have a life? 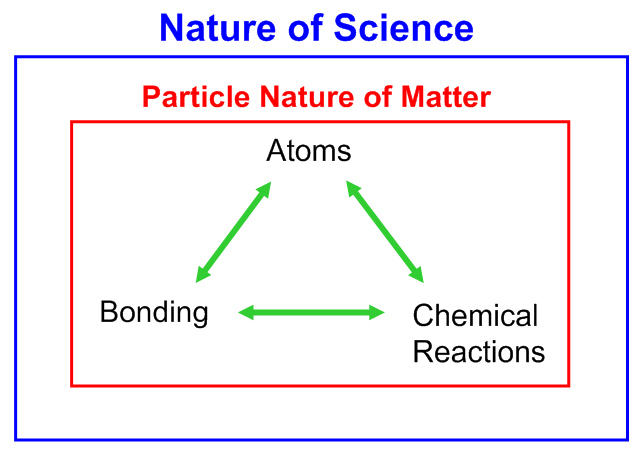 States of matter can be described in terms of motion of molecules and the properties and behavior of gases can be explained using the kinetic molecular theory. Off the top of my head, I can think of at least half a dozen ways that we could address and investigate this standard. Lacking specificity – yes, and that’s a good thing. I don’t need the MN Dept of Ed trying to teach my class for me. 2) The reviewer also makes a serious misstep by equating “manipulating the equation” and a scientific explanation. Apples and oranges! Calculating a number using a formula is NOT the same as understanding what the calculated number means, and explaining its relation to scientific phenomena. Ever hear of the Force Concept Inventory?? There are many students who could perform the basic algebra necessary for physics, but that doesn’t guarantee that they understand the concepts that are connected to those mathematics. A curriculum founded on these materials would be a hodgepodge that fails to convey a sense of system to the student. Indeed, it would be an invitation to science by memorization. This seems to be contradictory to his previous statements – lacking specificity, but somehow also failing to see the big picture… hmmm… not quite sure I see that, nor how it would invite memorization. Making standards more specific, in my opinion, would lead to a tendency to memorize and not worry about the “system” and how it all relates. You can find a much more thorough discussion of some of the biases and issues with the review, ultimately giving the review a (generous) D.